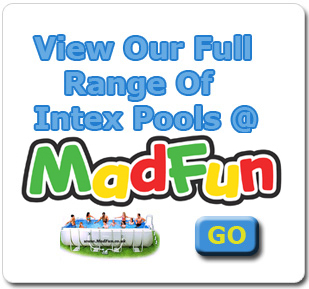 Intex Ultra Frame pools are the next size up from Intex Framed Pools. These very large pools allow you to swim up and down as they are extremely long and make very good use of additional space in your garden or outdoor area. Like the Intex round metal frame pools, the liners in Intex's rectangular pools are mode of SUPER-TOUGH sidewalls comprised of three separate layers for added strength. The two outer layers of heavy duty PVC ore bonded to on inner layer of strong polyester mesh to provide the optimum blend of strength and flexibility. The new design of the intex ultra frame pools means they are stronger and much easier to put together. The parts incorporated in the makeup of these large pools slot together very easily with no need for separate locking pins. The same areas apply for these pools when it comes to keeping them clean and germ free. The first is to minimise leaves, dirt and insects from accessing the water when not in use so a free pool cover comes with many of the pools. The pump included with the pool does a very good job of keeping very small items out of the water, do check the filter on a regular basis to make sure they do not need replacing. The last aspect is chemical treatments on the water to keep the chlorine and PH levels correct which stops germ build up within the water.